Born in the 1940's-We Remember! 2/27/18 Roaring Truth, with Meria and Jim Fetzer. Parkland – gun control and annihilating alternative media through censorship; losing youtube;f/b;google;truthers or plants? crisis actors;AR15;politically set up event; first Jewish Sheriff in Fla;4 deputies ordered not to enter the bldg at Parkland? teacher described shooter dressed as SWAT;tape delay; was the shooter Cruz the shooter? Why? Sandy Hook;Las Vegas shooting;Police killed 12,000 from 2000 to 2014-where’s the protests? trained in Israel;AIPAC, NRA, etc;4 steps to fix America;Syria war escalates;Fukushima-an extinction event no one talks about;radioactivity;EMP-protect the grid;WW3 -Korea,Syria or Ukraine? Lots more. 18th Year on the net! Education you don’t get anywhere else – commercial/censor free because of your subscription. Support truly independent media -endorsed by David Icke. All downloadable. 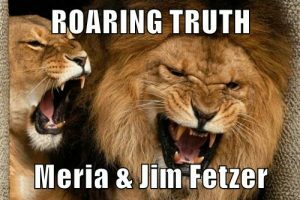 2 Responses to "Roaring Truth, with Meria and Jim Fetzer"
Listen, I worked in a high school where a trained, actual, COP had to draw a weapon on a kid and he was super upset afterward. I think a teacher would have a nervous breakdown if that is how a cop reacts to the situation. No way. No guns in the classroom. Teachers will leave the profession in droves if this becomes a reality. Just wanted to say, very good show. I enjoyed hearing both of your perspectives. Gave much to think about and consider. Glad you make room for differing perspectives, while giving the “why’s” of your individual view points. All shows © 2011 Meria Enterprises Inc and may not be reproduced or rebroadcast without express written permission.